We’d love your help. 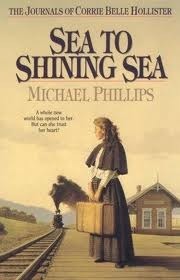 Let us know what’s wrong with this preview of Sea to Shining Sea by Michael R. Phillips. Her reputation has spread beyond California. Is politics her future . . . or something else? As the election of 1860 draws near and political tensions between the North and South threaten to escalate into a full-scale war, Corrie Belle Hollister finds herself thrust into the political arena. Her reputation as California's Woman Reporter and her vain attempts to help Colonel Her reputation has spread beyond California. Is politics her future . . . or something else? Her reputation as California's Woman Reporter and her vain attempts to help Colonel John Fremont in the presidential election of 1856 have brought her to the attention of the leaders of California's new Republican Party. And the handsome young political aide, Cal Burton, helps to convince Corrie that Lincoln, and even the nation itself, depend upon the influence she can wield through her speaking and writing. To ask other readers questions about Sea to Shining Sea, please sign up. Book you want to see made into movies! Another good read. I'm learning a lot about the history of our country in the years that led up to the Civil War, especially about what went on out west. I also found books 6-8 at a local used book store! This is book # 5 in the series of The Journals of Corrie Belle Hollister. Corrie's dream of becoming a newspaper writer is coming true. President Lincoln is elected and Corrie is writing and speaking to help the election. A surprise move for her and her father. The Pony Express was started and lasted 18 months. The year was 1860-62. Very good. I liked how the story portrayed the struggle, inwardly and outwardly of the issue of slavery, states rights, and power. It was a sad time in our nation's history when emotions were running so hot. Many wasted lives. The Pony Express element in the story was interesting as well. During the Civil War, I never knew that California tried to break up into two separate states, nor that California sent the Union gold & money often to help finance their cause for the war. True or not? I read this book many years ago and I've recommended it to my daughter. My least favorite although there are definite highlights to this one......Overall I would skip in a re-read of the series. Boys might find this one more interesting. A Library read for sure. I enjoyed the learning of the historical facts within this book.